Well, I’m still working on that jacket, with just the hems to finish! I swear I’ll finish this weekend. In the meantime, I finally wore this dress, which has been almost finished since August and finished since December. I knew it would make its debut at a board meeting, and it finally had its chance in February. I love this dress. The fabric is interesting but subtle, the fit is spot on, and it has stretch so it’s also quite comfortable. The pattern is Burda 9/15 #116. I caught my breath when I first saw it in the magazine, and knew I had to make it. Now I have to make it again in a fabric that actually shows the seaming! This fabric is by Halston, via Fabric Mart, a stretch poly suiting with an interesting pebbly texture. Okay, after all that praise, there is one thing I don’t like, and one thing I acknowledge isn’t perfect but I don’t care about. I flat out dislike the flare in the skirt back. 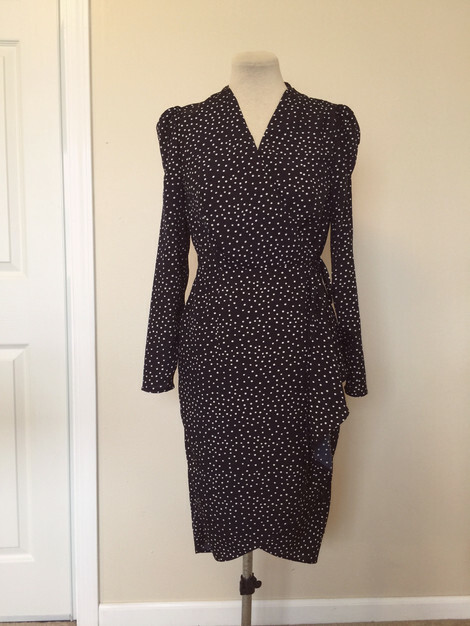 I had a RTW dress with this shaping years ago, and didn’t like it then either. Totally forgot about that! If/when I make this again, I will change the back to a plain straight silhouette with a vent. The other quibble is that the color isn’t the most flattering, but it’s not too terrible. In the end, it doesn’t matter and I love the dress anyway. It’s sure to be a go-to for quite some time! 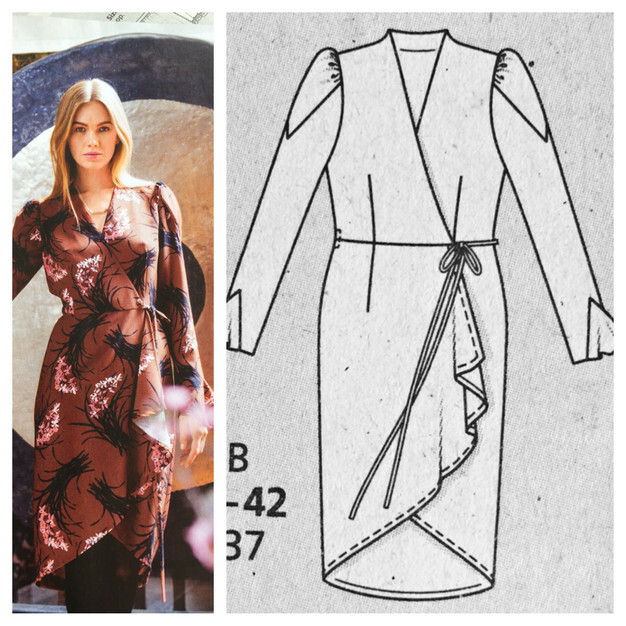 I started October sewing with the wrap dress from last year’s October Burda Magazine (#112) that I’ve had my eye on. It’s one of those designs I wouldn’t normally go for, and I’m not sure how I feel about those puff sleeves. The rest of the dress is quite good, though. Look at the photos! I know they are terrible, but it’s actually me in them and I am using a remote! Big step forward. Now I need to find a place to stand up my phone that doesn’t require climbing on a chair, although, honestly, I think it looks better on my dress form and am considering just giving up on real photos. I didn’t have suitable fabric in the stash for this dress, and got this poly crepe on sale at JoAnn. It’s a good weight for this dress, but all the details totally disappear. I’m not happy about the visible print repeat either, but it’s most noticeable from the back and I won’t see that part in day-to-day wear. The sleeves with the inset drew me to the pattern in the first place, but I don’t know. I had trouble setting them in because burda did not provide enough notches. Just one for the shoulder seam and one in the front. There was no indication that you should or should not ease the sleeve in aside from the gathered sleeve cap, and I’m pretty sure my gathering/easing is too centered, leading to bigger puffs than intended. I’m going to try wearing it with sleeves, but I predict they’ll come off before too long. Months and months and months ago everyone was making BHL Anna dresses and raving about them, and I always thought hm, that’s a nice dress, nothing special, but nice. Then I caved and bought it, and last month I finally made it up. The, oh, it’s nice I suppose, thought persisted, even when it was on my dress form, but then I tried it on. Oh my goodness! There’s something amazing about the proportions of this dress. I feel wonderful in it! The dress you see here is actually my second Anna. The first is made out of a navy cotton/poly broadcloth and it looks like a faded, sad thing with stiff sleeves in photos, though I love the way it looks on. The success of that dress made me pick up the same pattern almost immediately to make this dress for a family wedding. 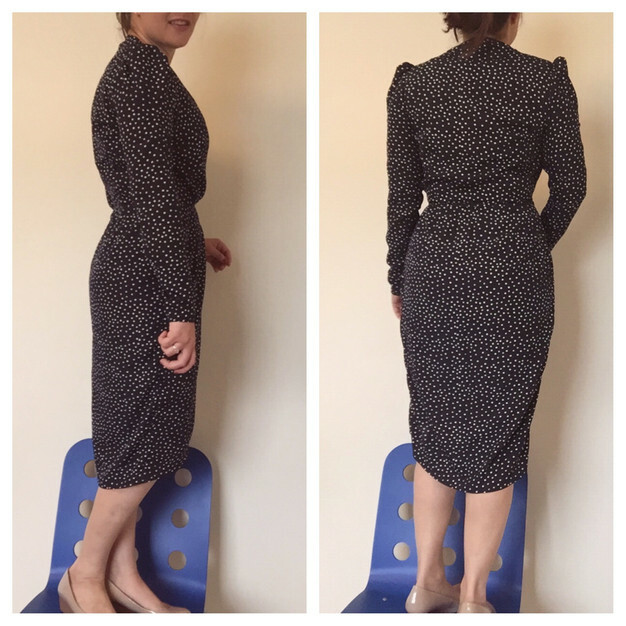 It was a fantastic wedding guest dress – simple, comfortable, flattering, just so easy. It performed well when I had to run (seriously run) around helping my husband put hundreds of beet tarts together too! The fabric is one of my beloved J. Crew floral chiffons that I got from Fabric Mart about a year ago. It’s not a very sheer chiffon, but I underlined with black to make things simple. I could take the waist in about an inch, but decided to leave it as is for now. I knew this wedding was going to be more stressful than usual, and would rather have my dress feel a bit big than the other way around! This dress actually almost didn’t get finished in time. I still had a hem to do the morning of the wedding, and while I thought I would have enough time before we left my help was suddenly seriously required for the tarts and it got pretty iffy. Without even realizing it was the same dress right away, I assigned my blue Anna as a back up – I think that proves that this is a good pattern for me! Finally, here is the assortment of desserts Eric made for the reception: beet tarts, bouchons, and green tea sables. This big tart was for his sister the bride – the others were just about 2″ in diameter and didn’t have any flowers. It was a lovely, fun day, and a week later we’re almost recovered!